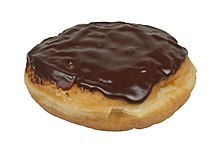 Doughnuts are a type of fried dough food. The following is a list of doughnut varieties. The terms below constitute either names for different doughnut types created using local recipes, or for the local language translation of the term for an imported doughnut product. Argentina – Kreppel, also called tortas fritas (fried pastries), is a fried pastry or quick bread that was introduced by German immigrants, and is similar to the Berliner. Facturas are a popular baked doughnut found in every corner bakery. Other names that may be seen in bakeries are berlinesas and bolas de fraile ("monk's balls"). Armenia – Ponchik, borrowed from Russian, is a deep-fried piece of dough shaped into a flattened sphere and filled with confiture or other sweet filling. Tukalik are similar to doughnut holes, and Armenian doughnuts are referred to as chickies. Australia – besides traditional ring doughnuts, jam doughnuts are common in most bakeries. Austria – Austrian doughnut equivalents are called krapfen and resemble the Berliner. Especially popular during carnival season (Fasching), they are solid and usually filled with apricot jam (traditional) or vanilla cream (vanillekrapfen). They are made from sweet yeast dough fried in fat or oil, usually with a filling of marmalade, jam, chocolate, champagne, custard, mocha, or with no filling at all. They are usually topped with icing, powdered sugar, or conventional sugar. Belgium – Smoutebollen or croustillons are similar to Dutch Oliebollen but usually do not contain any fruit, except sometimes for apple chunks. They are typical carnival and fair snacks and are dusted with powdered sugar. Bolivia – Buñuelos are a round fry bread. Brazil – Doughnuts are referred to as sonho, meaning "dream." Canada – Canadian variants include the beaver tail, cruller, dutchie, Timbits, potato flour doughnuts, and Newfoundland's toutin. Maple bars – bar doughnuts with maple syrup-flavored icing — are also commonly found in the US, especially in neighboring states, such as Ohio, Wisconsin and Michigan. Chile – Round fried filled doughnuts without holes are popular in Chile because of the large German community there. This doughnut is called a Berlin (plural Berlines). They may be filled with jam or with manjar, the Chilean version of dulce de leche. Another variety, much smaller, round doughnuts without filling nor hole, are known throughout South-America as "Sopaipillas". China – Although Chinese cuisine now features doughnut–type pastries borrowed from American and European kitchens, traditional pastries are somewhat different, often featuring thin, leathery dough surrounding plentiful mildly sweet or savory filling. Cantonese cuisine features an oval shaped pastry called Ngàuhleisōu (牛脷酥, lit. "ox–tongue pastry" due to its tongue-like shape). 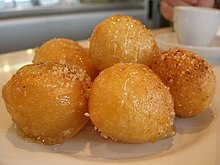 A similar food is called saa jung (沙翁), fried round dough balls with sugar sprinkled on top. A Shanghai dessert named 高力豆沙 is a variant of this, with oilier dough (originally made with egg white) and filled with red bean paste. Another variant uses thickened, lightly sweetened black sesame paste for filling and is sprinkled with sesame seeds. Other types are tikoy, zha gao, jin doi, chien doi, and zhá miàn quān. A salty variation are deep-fried doughnut sticks that are often quite oily, hence their Mandarin name, yóutiáo (油條, literally "oil strips"); in Cantonese, this doughnut–style pastry is called yàuhjagwái (油炸鬼); it is often served with congee, a traditional rice porridge. Czech Republic – Koblihy or vdolky (without a hole) are usually filled with jam and dusted with sugar. Vdolky are not as high as koblihy. 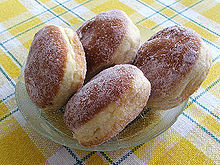 Bavorský vdolek or Bavorský koblih ("Bavarian doughnut") may be fried or baked and have jam and thick sour cream on top. Denmark – The "Berliner" without a hole is available in bakeries across the country and are called Berliner like in Germany. Another variant without the filling is aebleskiver, normally eaten with powdered sugar and jam on the side. Ecuador - Huevitos Chilenos ("Chilean Eggs"), a small variety of round Doughnut (without a hole), sold year-round on street corners around the country. The original Chilean Eggs are slightly different, and are called "Sopaipillas" in Chile and other South-American countries. Finland – Munkki (without a hole), Berliininmunkki/piispanmunkki (no hole, sugar coating), donitsi (with a hole), munkkirinkilä. France – Beignets are sometimes described as a French doughnut, and are popular in New Orleans, Louisiana. Germany – The Berliner (Berliner Pfannkuchen) is a predominantly German and Central European doughnut made from sweet yeast dough fried in fat or oil, without a hole. The doughnuts are filled with jams, such as apricot, plum butter or rosehip jam. 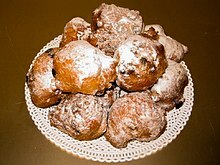 Other varieties and names are Obstkrapfen, Fastnachtskrapfen, Faschingskrapfen, Nougatkrapfen, Vanillekrapfen, Kreppel, Powidlkrapfen, and Apfelkrapfen. Greece – Svingi, Thiples, Loukoumades, Loukoumathes. 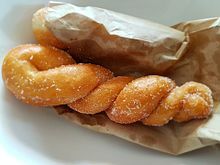 A doughnut-like snack called Loukoumas comes in two types, a crispy one shaped like the number 8, and a larger, softer one shaped like the number 0. Hawaii – popular doughnut in Hawaii is the Malasada and Punahou Malasadas. They were brought to the Hawaiian Islands by early Portuguese settlers and are a variation on Portugal's filhós. They are small eggy[dubious – discuss] balls of yeast dough, deep fried and coated in sugar. Hungary – Fánk, a round doughnut (without a hole) dusted with sugar, and Lángos, a flat fried bread made from yeast dough, served with sour cream and toppings like cheese, ham or chopped onions. Iceland – Kleinuhringir (doughnut), Kleinur, Berlínarbollur and Ástarpungar. Ástarpungar traditionally contain raisins. India – Vadai are savoury rings of dough made from lentils that are popular in South Indian cuisine. They are not necessarily sweet. Varieties of sweet doughnut-like pastries include badushah or balushahi. 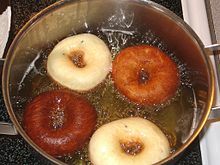 They are made like an old–fashioned doughnut, by frying the dough in oil, and are soaked in sugar syrup and sometimes flavored with spices. Badushah does not have the center hole. Another sweet in India is imarti, known elsewhere as jalebi. Adhirasam are a Tamil sweet doughnut with a long history. 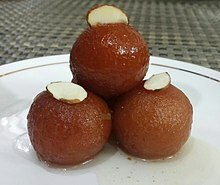 Another similar dessert is gulab jamun – ball–shaped pastry from buffalo–milk–based quick dough that is fried and floated in rose–water and cardamon flavored sweet syrup. Indonesia – Donat kentang is an Indonesian style fried mashed potato doughnut; it is a ring-shaped doughnut made from a combination of flour and mashed potatoes, coated in powdered sugar or icing sugar. Iran – Zooloobiya is a doughnut that comes in various shapes and sizes and coated in a sticky-sweet syrup. Razavi doughnut is ring-shaped with sugar on it. It is known as a symbol of Mashhad. 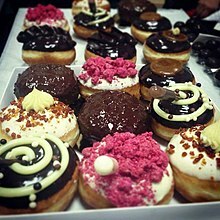 Israel – Sufganiyah (סופגניה, plural Sufganyot), like the German Berliner, jelly doughnuts, Boston cream doughnut, the Polish pączki, or the Russian ponchik, are fried, pierced and injected with jelly or custard, and then topped with powdered sugar or frosting. They have become a traditional Hanukkah food in recent decades. Traditionally they are filled with red jelly and topped with sugar icing. However, many other varieties exist, the more expensive ones being filled with dulce de leche. 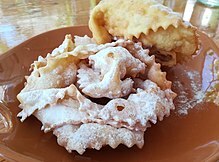 Italy – Struffoli, Pignolata, Guanti, (Assisi) Bastoncello, (Calabria) Scaddateddi, Zeppole, Chiacchiere, Lattughe (this may not be classifiable as doughnut, but it is fried pastry, in a Lettuce" style) Cenci, Donzelle, Frappe, Sfrappole, Bugie, Crostoli, Frittelle, Grispelli (potato dough speciality from the Catanzaro region), Ciambelli (Cocullo, Abruzzi), Bomboloni (Bombolonas), and (Palermo, Sicily) Sfingi. Jersey – (Channel Islands) Jersey Wonders (Mèrvelles). Korea – Chapssal doughnut, twisted doughnut. Many bakeries in South Korea offer doughnuts either filled with or made entirely from the Korean traditional rice dessert tteok. These come in a variety of colors, though they are normally in green, pink, or white. They are often filled with a sweet red bean paste or sesame seeds. Lithuania – Spurgos are doughnuts with jam filling and sugar coating. 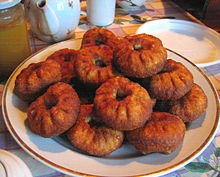 There is also a local variety of doughnuts made from cottage cheese dough ("Varškės spurgos") which contains no filling. Mexico – Buñuelo, Churro, Sopapilla. The Mexican Donas are very similar to doughnuts including in the name; the dona is a fried–dough pastry–based snack, commonly coated with cinnamon sugar or granulated sugar, or dipped in chocolate. A pelona, alike Berliner, is a pastry similar to local doughnut with no central hole made from sweet yeast dough (Danish dough) deep fried usually in oil, filled with vanilla dulce de leche (in this case local manjar) and few raisins, conventional sugar as topping. Starting on a local doughnut`s dough, rolled, shape molded, deep fried, sliced, opened two halves, filled, recap and topped. Is a popular snack in the street food vending but rarelly seen in bakeries or any other food menus because it is dense and loaded with carbohydrates. Poland – Pączki are round jam-filled doughnuts, known in Poland at least since the Middle Ages. Jędrzej Kitowicz wrote that during the reign of the August III under influence of French cooks who came to Poland at that time, pączki dough baked in Poland has been improved, so that pączki became lighter, spongier, and more resilient. Russia – Ponchik, Russian "ponchiki" (Russian: пончики), and "pyshki" (Russian: пышки), as well as Ukrainian pampushky (Ukrainian: пампушки), are deep-fried and sphere-shaped pieces of dough which could have a sweet (e.g. jam or powidl) or savory filling (e.g. ground meat or quark), or left plain. More traditional are deep-fried versions of pirozhki, as well as Tatar pərəməçlər, known as belyashi in Russia. Scotland – "Doughrings" is an alternative term for ring doughnuts. Square fudge doughnuts are also a tradition. Serbia – Doughnuts similar to the Berliner are also prepared in the Northern Balkans, particularly in Croatia (Ustipci, Krofnepokladnice or Krafne) and Serbia's Vojvodina province. They are called Krofna, a name derived from the Austrian Krapfen. South Africa – Koeksister, An Afrikaner desert of plaited dough, fried and steeped in cold syrup. Oliebolle met Suurmelk ("sour milk doughnuts"). Another variation is the Vetkoek, dough deep fried in oil, served with mince, syrup, honey or jam. Koe'sister A spiced doughnut rolled in coconut. Spain – Churros, Porras, Chimeneas, Orange Roscos, Wine Roscos, Roscos de anis, Rosquillas de Ledesma, bimuelos, birmuelos, bermuelos, burmuelos, bunyols, chuchos, Rosquillas listas de san Isidro, rosquito tonto, rosquilla tonta. Buñuelos, bunyols in Catalonia and the Balearic Islands, bolo de vento in Galicia or kruxpeta in the Basque Country, are a traditional Easter pastry in the form of small balls without a hole. They can be sweet or savoury, but usually filled with custard or chocolate. The American or German–style donut is sometimes called a berlina. Sweden – munk (doughnut), klenät, flottyrring. One example is vaniljmunk which looks similar to the German Berlinger but is filled with a vanilla custard. Taiwan – tian tian chuan, (lit. "sweet sweet ring"). Ukraine – pampushky (sweet filling or garlic flavored) and рonchik, Ukrainian "ponchyk" (Ukrainian: пончик), as well as Russian рonchiki (Russian: пончики), are deep-fried and sphere-shaped pieces of dough. United Kingdom – Similar to North American doughnuts, but traditionally topped with granulated sugar rather than powdered sugar or glaze. Jam doughnuts are ball-shaped, coated in granulated sugar, and have a filling of strawberry or raspberry jam (alternatively, of caramel or vanilla custard). In some parts of Scotland, ring doughnuts are referred to as doughrings, with the term doughnut being reserved exclusively for the nut–shaped variety. Glazed, twisted rope–shaped doughnuts are known as yum–yums. It is also possible to buy fudge doughnuts in certain regions of Scotland. In some parts of Northern Ireland, ring doughnuts are referred to as gravy rings due to their being cooked in oil, itself colloquially known as "gravy". ^ Karin Engelbrecht. "Traditional Dutch Apple Beignet Recipe". About.com Food. Retrieved 21 May 2015. ^ "Café & Persian History". Look up Doughnut in Wiktionary, the free dictionary. This page was last edited on 18 April 2019, at 00:15 (UTC).